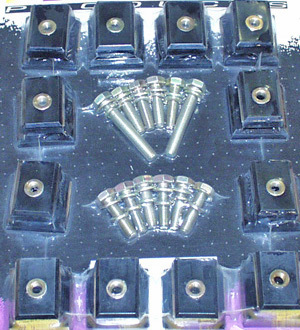 THIS BODY MOUNT BLOCK KIT CONSIST OF 13 1-1/2" HIGH BLACK POWDER COATED ALUMINUM BLOCKS TO RAISE YOUR FJ40. 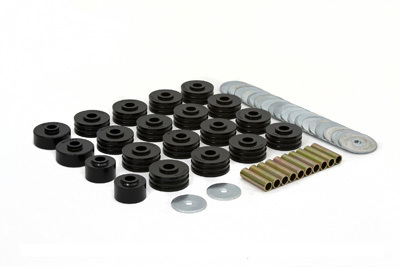 THIS BODY MOUNT KIT USES POLYURETHANE PADS WITH METRIC HARDWARE INCLUDED. 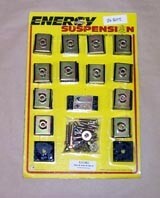 THIS KIT WILL FIT FJ40 LAND CRUISERS 1958-1978. CONSTRUCTED FROM 5052 MARINE GRADE ALUMINUM ALLOY THAT IS 5/32"(.156") THICK. 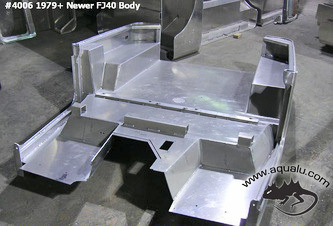 IT HAS BEEN DESIGNED TO WORK WITH THE FACTORY STEEL COWL. 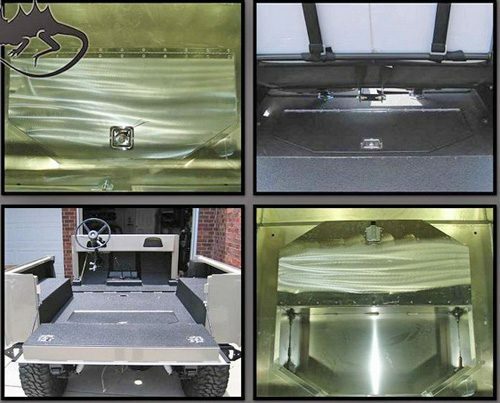 IT ALSO WORKS WITH THE FACTORY SIDE DOORS, REAR AMBULANCE DOORS, HARDTOP, SPARE TIRE CARRIER, AND SEATS. 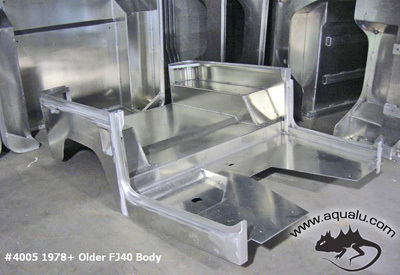 THIS REPLACEMENT ALUMINUM BODY TUB FITS 1978 AND OLDER FJ40 TOYOTA LAND CRUISERS. 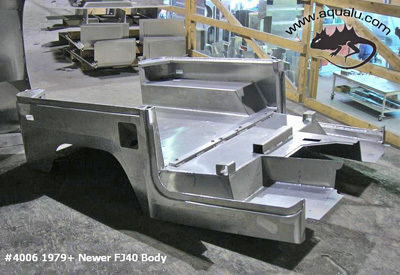 THIS TUB IS FOR A 90" WHEEL BASE FJ40. 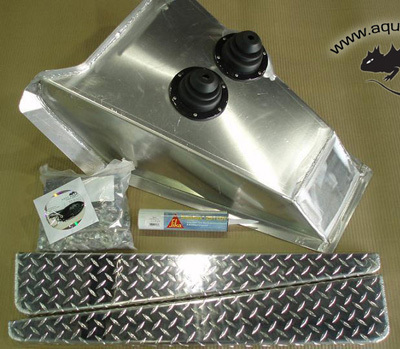 THIS FJ40 ALUMINUM STORAGE DROP BOX IS A WELD-IN ITEM AND IS USUALLY ADDED AS AN OPTION AT THE TIME A CUSTOMER ORDERS A REPLACEMENT TUB. THIS STORAGE BOX CAN NOT BE WELDED TO A STOCK TUB BECAUSE OF DISSIMILAR METALS(ALUMINUM VS STEEL). THIS IS A LOCKABLE STORAGE SOLUTION THAT SITS FLUSH WITH THE REAR FLOOR AREA OF THE TUB AND MEASURES APPROXIMATELY 33" LONG X 16" WIDE X 10" DEEP. THIS BOX OCCUPIES THE AREA BORDERED BY THE FRAME RAILS, THE REAR BUMPER "C" CHANNEL AND THE TUBE THAT THE REAR SHOCKS ATTACH TO. THE STOCK EXHAUST WILL HAVE TO BE RE-LOCATED. EXTENDED STAINLESS STEEL D.O.T. 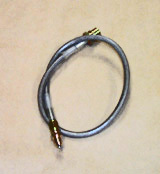 APPROVED BRAKE LINES ARE AVAILABLE FOR FJ40 LAND CRUISERS WITH LIFT KITS INSTALLED. 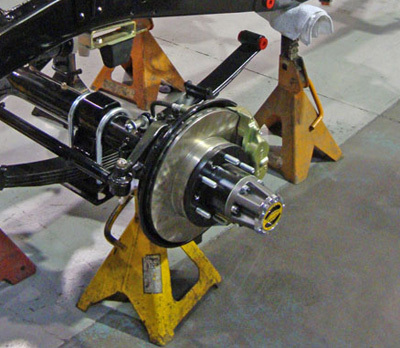 THESE LINES RUN FROM THE FRAME DOWN TO THE REAR AXLE HOUSING. 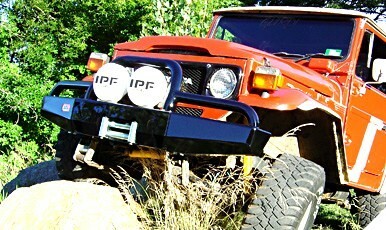 THIS BRACKET SET RE-POSITIONS THE FRONT BUMPSTOP ON THE FRONT AXLE HOUSING AFTER THE SERIES II SHACKLE REVERSAL KIT IS INSTALLED. ONCE INSTALLED, THE FACTORY OR AFTER-MARKET BUMPSTOP CAN BE MOUNTED TO THIS BRACKET. HEAVY DUTY MIG-WELDED CONSTRUCTION INCORPORATES 1-7/8" SEAMLESS HEAVY DUTY WALL TUBING AND INTEGRATED TURN SIGNALS.